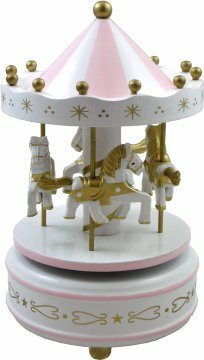 A musical carousel with four miniature horses that gently go round as the music box plays. Hand painted in white with pastel pink & gold highlights. A beautiful keepsake music box that is sure to delight. Clockwork wound by turning the top of the carousel. The top & horses revolve slowly as the music plays. Please be aware that these are not toys & contain small parts.